Here at Knox Jewelers, one of our new favorite custom created engagement ring is built around a breathtaking 1.30 carat round brilliant cut diamond set into a milgrain edged center bezel. The dynamic center stone is surrounded by a flattering flared band accented by bead-set diamond on either shoulder. Hand wrought filigree, hand cut relief engraving and a unique half moon keyhole add luxury to the ring’s profile view. Milgrained edges add a vintage inspired finishing touch to this ornate custom engagement ring. Design 3267 is a fully imaged blend of antique details and modern aesthetics, our favorite combination! This magnificent design can be recreated to accommodate any type, shape, or size center stones. Contact Knox Jewelers today to custom tailor this design to your preferred precious metal and central gemstone selection to create your own one-of-a-kind engagement ring! Near the conclusion of 2015 we predicted the upcoming trends in engagement rings for the following year. At Knox Jewelers, tuned our trend radar in a large part through customer requests for custom engagement rings and wedding bands. One of those predictions, the mix metals trend, has had numerous requests as of late and is staying true to course as a favorite of 2016. Mixing metals is more popular than ever before in the bridal jewelry scene, especially now when mix-matched stacked wedding bands are in vogue. Most brides-to-be seem to be in the mind-set of ‘why choose one metal when you can have two shades, and while we are at it throw in a colored gemstone’. Blending engagement ring and wedding band tones creates a unique look, making your ring exclusive to you, and setting your rings apart from one another as well. Your wedding band should be as one-of-a-kind as your engagement ring and your relationship, as it reflects your future and commitment. Today in the bridal scene there seems to be no room for traditions or rules when it comes to wedding bands. Mixing metals could be the perfect way to make your band stand out against your perfect engagement ring, and give it a life of its own. There are so many ways to make your engagement ring and wedding band distinctive, but color is always a great way to demonstrate your unique bridal style. 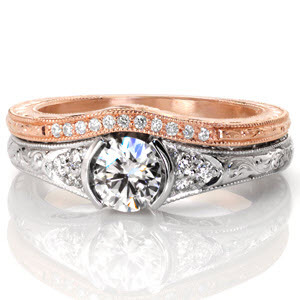 A bold rose gold matching band adds contrast to our white gold Seville engagement ring. You may think that the cool allure of white gold and platinum clashes with the warm tones of rose gold and yellow gold, but paired right, they can offer a winning combination. The renewal of the mix metal trend is growing at such a fast pace for good reasons. Combination metal engagement rings offer many more styling possibilities and it allows you numerous options when it comes to selecting your wedding band or multiple bands. On a more important note, mixed metal rings alleviate the stress and hinder the mindset of having to match all of your other jewelry for the rest of your life to shade of your bridal set. There are many eye-catching ways to create a two tone look within your engagement ring or wedding band pairings. There are bold, elaborate mix metal wide bands to subtle hints of color, like the addition of color contrasting filigree curls. One very popular interpretation of the trend it to create a shaded diamond halo that differs from the rest of the ring, to draw attention to and highlight your center stone. Multiple band engagement ring, like our Fireworks Design, are brought into a whole new light when one band is featured in a warm shade of gold. If a small amount of two-tone is all you are ready for, try slight alterations, like colored center prongs, yellow or rose gold filigree curls or a colored contrasting center bezel. The two tone trend is not just for bridal sets, we have had just as many, or more, requests for gents wedding bands created in contrasting colors. 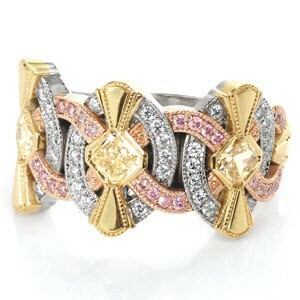 Bold bands can be created by pairing warmer rose and yellow golds with sleek platinum or white gold. Any of our custom wedding bands can be altered to be features in a two tone look. We can help you custom create anything you have in mind when it comes to your mixed palette of rings and bands. Mixing metals is a modern and fashionable way to express your style and a easy way to set your bands apart in a crowd. If you are so inclined, we can even custom create rings in three tones, like our newest wide band ring Tiara. As you can see below, colored gemstones are also a way to upgrade a custom design from the ordinary. Knox Jewelers custom Tiara wide band goes above and beyond into a three-tone look. Metals color is only one of the ways to can help you make your ring or band into a one-of-a-kind creations. All of our finishing details are created by hand, so things like engraving, filigree, milgrain and side diamonds can add to the final look of a two toned creation. There are plenty of ways to play with engagement ring and wedding band traditions but interpret them in your special way. Contact Knox Jewelers today to start custom designing your two-tone, or even three-tone, bridal set of your dreams. One of our new favorite custom created engagement ring is built around the mesmerizing step cut facets of a 1.00 carat asscher cut diamond held in a low four prong setting. Marquise shapes set with micro pavé diamonds and square carre cut diamonds are placed together in this design to create a rhythmic pattern of ovals and arches. Bezel set side diamonds and milgrain edges add lavish antique detailing to this wide band engagement ring. This mosaic inspired design can be recreated to accommodate any type, shape, or size center stones. Contact Knox Jewelers today to custom tailor this design to your preferred precious metal and central gemstone selection to create your own one-of-a-kind engagement ring! Shopping for an engagement ring can be a daunting endeavor, especially today when there are hundreds of available ring designs and styles available. With so many options, the process of selection can seem overwhelming. If you have started to look for an engagement ring, you have probably seen what is available at the mall or your local chain store. If nothing has yet satisfied your desire for a unique ring design, Knox Jewelers can help! Knox Jewelers’ custom creation process gives you the ability to personally design the one-of-a-kind ring of her dreams. Having a ring custom created from the ground up ensures that you will be satisfied with every element of the design. Your unique creation can reflect her personal style as well as be a lasting statement of your love. Having an engagement ring custom made can be an incredibly rewarding experience. We are here to help with any questions you may have during the decision making process leading up to the creation of your piece. Once a ring has been put into production we also send you email updates showing your ring during every stage of the creation. If you are interested in having a ring custom created through Knox Jewelers, below is an easy checklist of the things you will need to consider before your unique ring can be brought to life. Custom creating a ring takes time. If you are planning a special proposal for a specific day, please give our jewelers a leading start to finish your ring in time. There are several steps your piece with need to travel through between conception to completion. The production time on a ring is usually several weeks and can vary depending on the time of year and the complexity of the project. Please contact us to inquire on the current production timelines. A major component in your final engagement ring design will be the selection of your center stone. There are numerous center stone options available on our online diamond and online gemstone lists. Any ring design can be custom tailored around the diamond or sapphire you are ultimately drawn to. Sapphires center stones are available in varying colors, cuts and sizes. A diamond’s size, shape and quality will need to be taken into a consideration. Diamond shapes include round, cushion, radiant, princess, oval, pear, emerald, asscher and marquise. If you are not sure which shape diamond to select, take notice of other jewelry she wears or pieces she is drawn to. The round brilliant cut is the most popular diamond shape, but princess, cushion and oval cuts are growing in popularity. 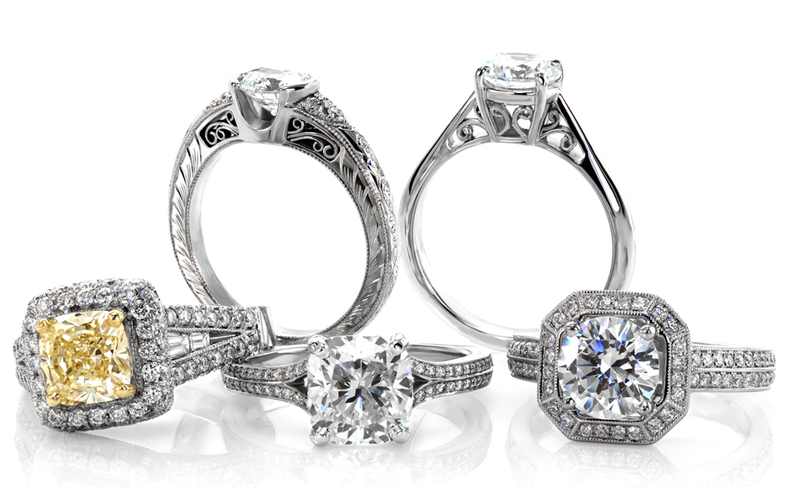 The options are endless when selecting an engagement ring style. Inspiration for a custom piece can be taken from a sketch, photo or an idea on altering one our stock designs. Deciding on a ring design for your bride-to-be can be difficult. Think about her personal taste, is she classic, contemporary, vintage, colorful? Pinterest can be a useful tool to discover her preference in engagement rings. Remember things she has pointed out or mentioned in passing. The way your partner dresses and decorates could also tell you a lot about her jewelry style. If you prefer to have her help in creating a forever custom ring after you have proposed, we do offer a temporary solitaire option as well. 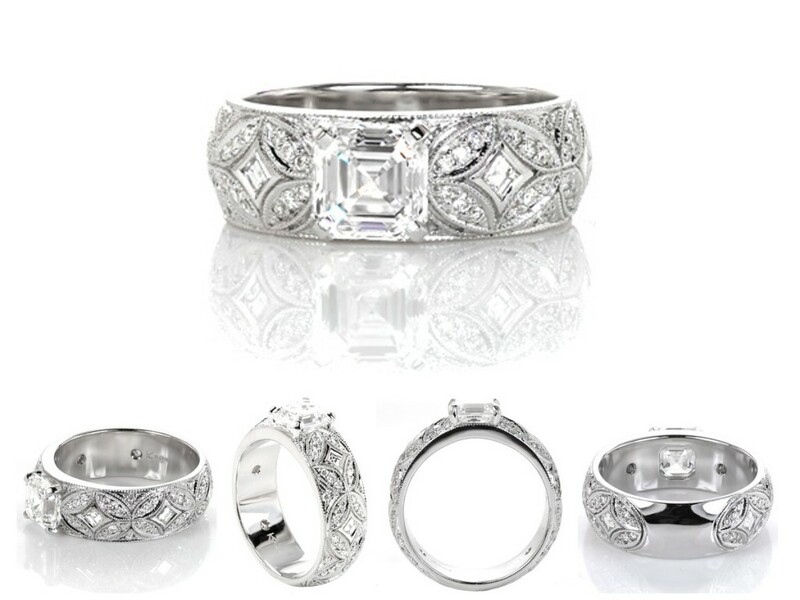 This could alleviate any worry about selecting the perfect ring design. Any of our custom engagement rings can be created in either Platinum, 18 karat or 14 karat white, rose or yellow gold. Platinum is always recommended first to contribute to a ring’s heirloom quality. Warmer rose gold and yellow gold rings are starting to be requested for engagement rings more and more often. All of our custom rings are engineered around her exact finger size. If you are unsure of her ring size, we do have an online tutorial to help you estimate a close fit. Contact Knox Jewelers today with any questions on creating your heirloom quality custom engagement ring. Give her a one-of-a-kind piece specially designed by you for her. With our unique creation process we can help you create the ring of her dreams!